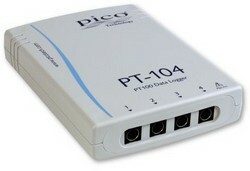 The PT-104 platinum resistance data logger gives you the ultimate in resolution and accuracy. You can use it to measure temperature, voltage and resistance. You can connect to it directly using either USB or via ethernet over a computer network, or you can connect to it remotely using a modem. When the accuracy of your temperature measurements is paramount the PT-104 is what you need. Although accurate temperature sensors are widely available, it has been difficult to take advantage of them due to errors caused by the measuring device. The PT104 however, is inherently accurate due to its novel design. Rather than relying on voltage references (which tend to be temperature sensitive) it uses 'reference' resistors which are extremely stable (low temperature co-efficient and drift). The exact value of each resistor is stored in an EEPROM to provide the ultimate in accuracy (yearly re-calibration is recommended). To achieve the 0.001 °C resolution a highly-advanced ADC is used that can resolve to better than 1 part in 16 million. UKAS calibration is optionally available at extra cost, either of the unit on its own or with RTDs as a system. Please contact us for more details.